I love glow-in-the-dark stuff. I had a necklace-and-earrings set in junior high (that I used to wear at the movies) … I still have the necklace, although all the glow-juice has worn off. I currently have a glow-in-the-dark watch, although I never remember to wear it (and I go to fewer movies now, and it’s not so funny to glow in the movies now that everyone is glowing as they check their iPhones when the plots start to drag). 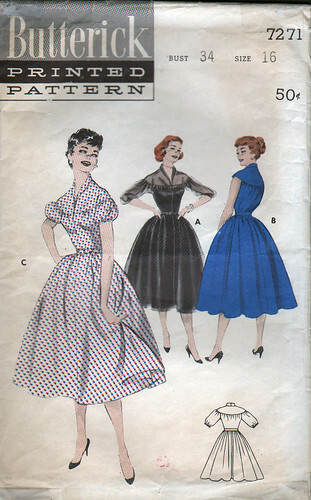 I’d love to find some glow-in-the-dark lining fabric to use under a black lace for a dress. In the daytime it would look just like a normal lining, and at night you would look like a city nightscape! Perfect. Sadly, it looks like glow in the dark fabric is really expensive. Anyone know of a better source? 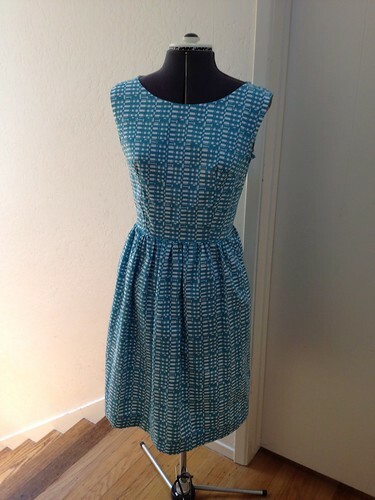 Click on the images to visit this dress at LuciteBox.com … Holly is having a sale to help replace her broken bike, use the code BIKE at checkout to get 25% off! Wow! Thank you all so much for all the fantastic subtitle suggestions last week! I totally believe that “wisdom of crowds” thing now. Would you three wonderful women please email me with your addresses so I can send you your prizes? Of course, the book will probably only have one subtitle, and the choice is up to the publisher, but with so many excellent suggestions, something good has to stick! 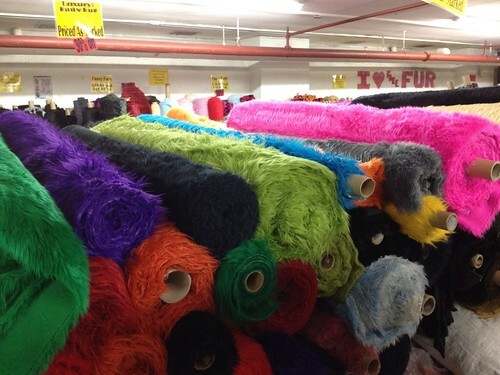 And, for no apparent reason, here is a picture I took of a giant collection of Muppet fur this past weekend. Enjoy. It’s a really pretty dress, isn’t it? Although it looks as if pink dress is suffering from unrequited love for Blue Jacket. And the leprechaun version is a bit unusual. But I digress. I bought the fabric yonks ago on eBay — it’s cotton satin, and if it weren’t so lightweight, I’d say it was supposed to be upholstery fabric, or that maybe it’s from Ikea. Either way, I don’t care, because it’s really, really pretty. 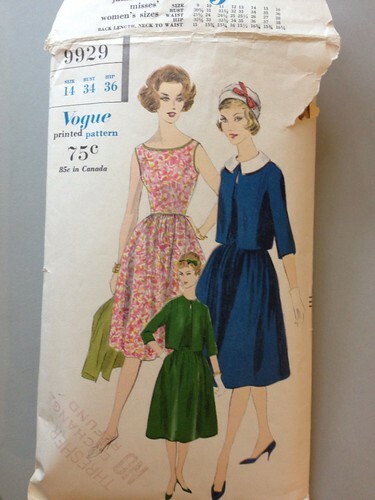 This dress is definitely going to be made again — I have to make the pockets a little deeper (you can see how they stick out slightly here, with the bulk of my wallet, phone, pocket notebook, lipstick, etc. in them) and the skirt should be about two-three inches shorter. 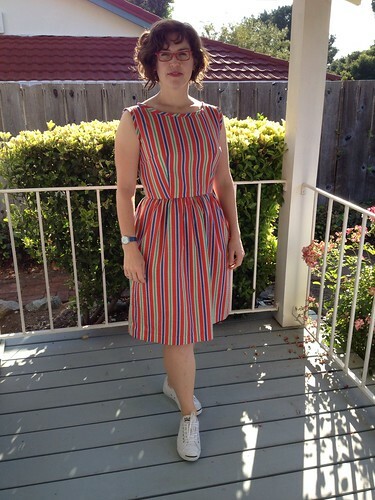 I may even take this hem out and re-do it, this length is a little dowdy. 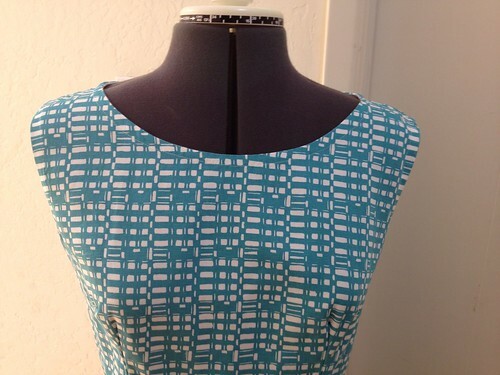 I think this pattern is perfect for Liberty Tana Lawn, especially with a very deep hem to give it some weight, so that’s what I’ll probably try next. The flowers look red in some lights and pink in others, but it’s a true deep raspberry, and (I think) really pretty. 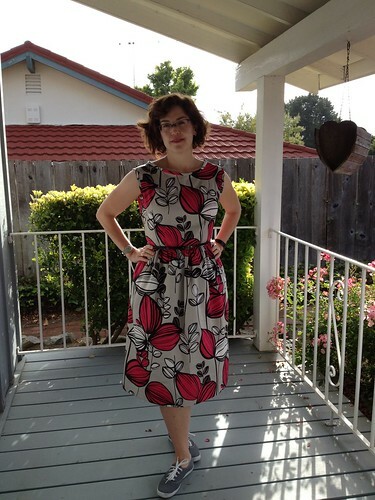 The background is a taupe-y gray, so my gray Keds aren’t the best match, but I’m riding my bike in this dress today, and Keds are safer & more comfortable. Skinny belt is from H&M, watch is a silver-taupe Swatch that *does* match (unlike the Keds), and I’m wearing a black leather bracelet (which you can’t really see). I also put a black cotton cardigan on top of this, for work. I will have an update and the winners of the Book Subtitle Contest early next week … I may be looking for beta readers, too, if you are interested drop me an email! Many eyes make light typos.